Before I move on from my childhood tales–adolescence is beckoning–there’s one more I’d like to share with you. This piece was originally published in about 1996 on Star-Thrower, a website featuring autobiographical narrative funded by the Indiana Humanities Council. My cousin discovered it online some years later, when she googled “Billy Sunday.” This threw me into my first confrontation with the issue of naming names. My aunt never really forgave me–I think she took issue with how I characterized the smell of her cottage. Acceptable collateral damage, in that instance. I’ve heard that one’s sense of smell is the quickest key to memory. Summer lake smells prove it for me. One whiff of motorboat fuel over lake weeds and I’m eight years old, on eternal vacation, playing miniature golf as it’s played at Winona Lake. Hit the parting of the Red Sea, tunnel under Mount Sinai, dodge the pyramids as you putt through the stories of the Old Testament. I spent much of my childhood summers in northeastern Indiana, visiting my relatives in a strange religious resort. Winona Lake was a benign cult headquarters. In its heyday it was the home of evangelist Billy Sunday, famous for his tabernacles and sawdust trails. 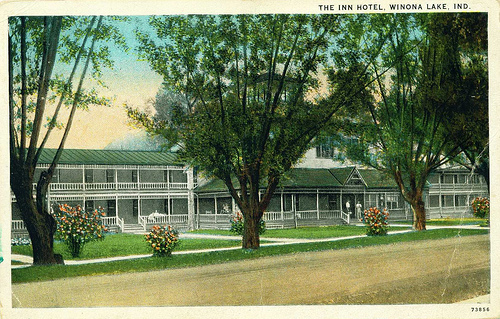 His first cavernous hall stood at the center of Winona Lake. Spreading out from there were the grounds of his kingdom: an outdoor amphitheater, formal gardens and parklands, diversions to amuse the visitors who stayed at the big white hotel. Winona was a kind of factory town of the Methodist spirit. In addition to the Billy Sunday campus there was a seminary, a religious publishing house, and lots of youth camps, including one of the original Boys’ Towns. 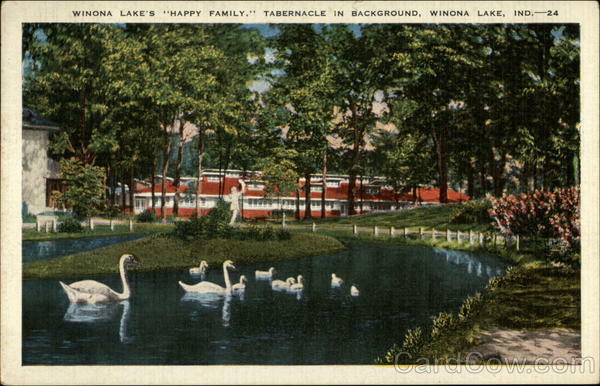 The religion that built Winona Lake had firm ideas about the sinfulness of pleasure. Strong drink and dancing were definitely out. Music other than hymn-singing was suspicious. But this was a resort town, after all, and some rules could be bent a little. Even though the beach was posted “no swimming or eating ice cream on Sunday,” people probably did. Nearby they could skate at the roller rink, a giant screened porch reaching out into the lake, and play the biblical miniature golf course. In the 1920s Winona must have been a festive place in its proper way. In 1965 Winona Lake was still providing the same amusements. Empty but not abandoned, it had the perpetual air of an amusement park closed for repairs. I had the free run of it. The place was rich with the moldy smells of the past. We visited old people there; they smelled of castile soap. 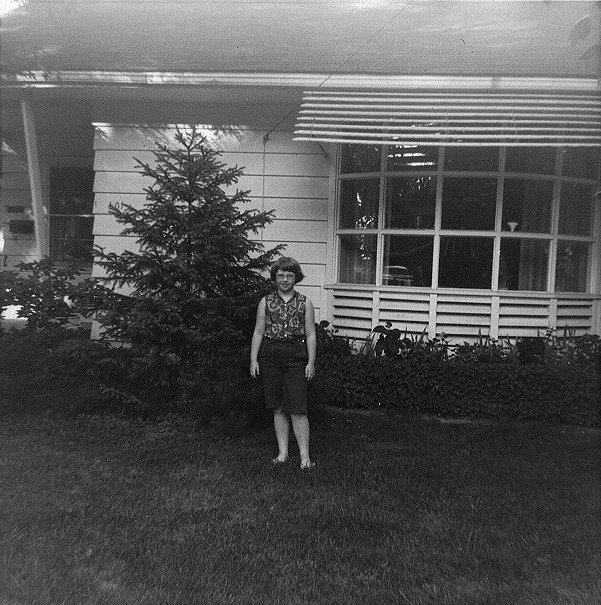 My relatives congregated on summer evenings at the musty lakeside cottage we called The Brick, as opposed to the wood-sided house a mile inland where my grandparents lived. The difference in the smell of those two houses is the difference between wet and dry rot. Every corner of The Brick was filled with my grandfather’s scavenging. I loved the library books he’d collected, discarded when too old for circulation, strange Victorian girls’ fiction. I was the only girl among five brothers and cousins of similar age. My brothers’ memories of Winona Lake probably run to boy-pack boat and fish stories, scents of bait and motors. Mine are of solitary girl games, and the smell of damp old books. The past was more real than the present in that dream-time. I’d wake on the screened porch in the humid Indiana morning, read dated stories set in hospitals or ocean steamers, then wander off to amuse myself. When I think of me I have to resist seeing myself in Victorian high-button shoes and dress. I loved the Billy Sunday grounds, so different from the suburbs of the rest of my year. There was a swan pond and a grotto. There were fountains and statuary, to provide destinations for the paths that wound along under the shade trees. All were over-grown, tumbled-down, dank. The low path led into the garden, a compass rose of paths where a little girl could hypnotize herself with the rhythmic sound of wheels bumping from wedge to wedge, round and round the defunct central fountain. Further paths led past the miniature golf course to the shuffle-board court and horse-shoe pitch, where idle oldsters sat on park benches–grown bored with playing years before I came along. The high and low paths converged at the tabernacle. It must have covered half an acre. It presented itself as three low courses: a brick half-wall rose to the windows, a band of shutters that could be propped open to breezes from the lake. Above that was the vaulted roof, some kind of engineering miracle produced by Billy Sunday, terminating in broad eves to shade the open windows beneath. I never saw the tabernacle in use but of course my mother remembers it in action just as vividly as I remember its ghostly quiet. Her stories conjured the sounds… exhortations of evangelists, pump organs accompanying choirs. And the smell! She gave me the sawdust, used to pave the floor inside. By her telling she planted in me that smell-memory, salty sweat and sawdust, combining the dangerous excitement of the circus with the glorious drama of Gawd. There were other, more secular pleasures to Winona Lake… pork tenderloin sandwiches from the Flagpole Drive In, frozen custard sold from a quonset hut. We who never dined out at home had lunch here almost every day. We swam off the pier at The Brick for hours, bobbing in inner tubes, rocked almost to sleep by the rhythmic waves from the motorboats. I don’t know why we never learned to water-ski. Our alternative was to ride in Uncle Tom’s motor-boat in great lazy loops, inspecting the shore. “Looks like the Edisons are adding a deck,” he’d say. “Looks like they’re finally building something over at the Bible Camp.” Hoosiers never tire of commenting on their neighbors’ activities. From the boat it was easy to inspect The Island, which was the oldest part of town, across the canal from the main street and the Sunday grounds. Here cottages so old they were made of logs were squeezed by rich follies added later, castles and haciendas, and sprawling boarding houses. Every summer our folks told the same stories about old Winona Lake, as we trolled its shoreline, and we loved them like fairy tales. Like a movie set, like Nuremburg, Winona Lake was a place built for great gatherings of people, a backdrop for monumental, life-changing events. Billy Sunday is a historical footnote today, but his energy lasted for half a century, and I absorbed it. The cripples and the alcoholics, stumbling up the sawdust trail to lay down their sins and be redeemed. The young lovers meeting under the tall oaks by the swan pond. Sticky summer heat unrelieved by ice cream or swimming, one day out of seven.